Above: The Gravel Project Performs at Stowe's Mansfield Lodge February 2017. 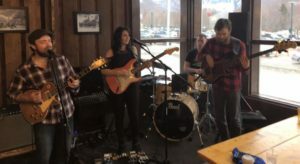 This past week at Stowe Mountain Resort's busiest time of the year, The Gravel Project performed for two days in front of a handful of tired skiers and snowboarders at the Mansfield Lodge. The result was a great couple of sets that would be the best of this year at the Lodge. It was an unusually warm week for President's day up at Stowe Mountain Resort. Still, that didn't prevent the skiers from packing in the place last week. On Tuesday & Wednesday night last week they were fortunate enough if they were at Mansfield Lodge to hear some great tunes from Boston's own The Gravel Project. A new force in the blues rock genre, The Gravel Project performed several sets over two days that had people cheering and clapping and enjoying the music. Driven by Andrew and Jordan Gravel, the band is a wonderful mixture of blues and classic rock. Each member of the band performed extraordinary well up at Mansfield Lodge this past week. One of the highlights of their performance was a drum solo by Dave Fox during a classic Allman Brothers Band tune. Dave was by far one of the most entertaining aspects of the group, adding his own African Cuban drum sound that spiced everything up. The guitar skills from Andrew was pretty impressive, but yet another highlight of the two days was Sonya Rae Taylor who filled in for Jordan. She was just as good as Andrew on guitar, owning up to classic rock riffs and the band's own songs. Both Andrew and Sonya shared vocals for the two days, and they both sounded great. Bassist Ryan Taylor also shared his musical talents. Together, the group provided great jams throughout the two days they were at Stowe. The Gravel Project also performed a number of other covers, including their own version of "Shake Down Street" at the end.